Do you have a problem you cannot solve? And Your brain tries finding solutions days and nights. You feel lost, nervous and maybe somewhat exhausted. And when you are just about to give up, you suddenly get solution served even without asking for help! What is that? ● Power of your mind? None of that! It is Bærum International Hub community spirit in action! Meet wonderful people. Find good solutions. Connect and stay inspired! 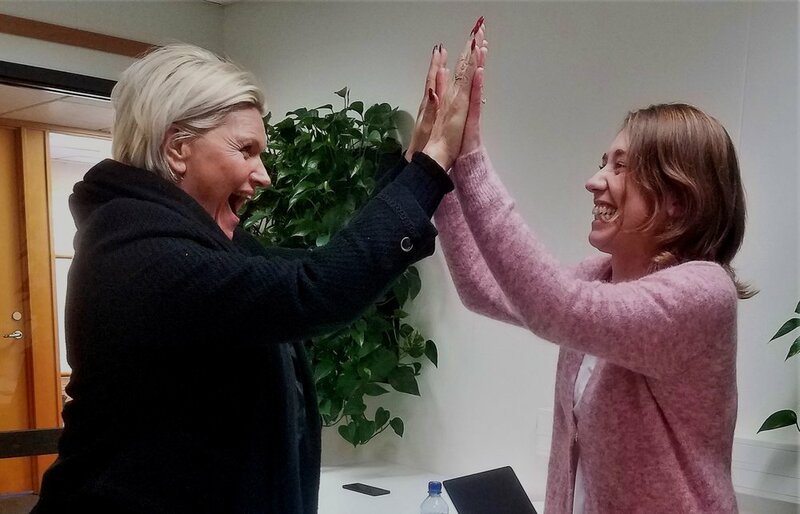 Magic started today when Lena Helen Garstad and Birgitte Nitter met in our hot desk area. Both Helen and Birgitte just have become new members of our community. The ideas were bubbling, knowledge was shared and believe me each of us received the information we were looking for. Within 30 minutes, we got a coaching session on relationship, selling strategy, self-confidence and experienced virtual Bergen together with Lena Helen. Birgitte shared her knowledge about how to use avatars\personas for creating blog posts. Lena Helen Garstad is therapist, mental trainer and organizational psychologist in Under The Umbrella. When she found out, that Bærum International Hub shares green vision together with Høvik park, she decided to check upon our office spaces. We are happy that Helen will be collaborating with us. Her enthusiasm and positivity energized everyone: we don't need more of vitamin D! Birgitte Nitter is a freelance writer, social anthropologist and consultant in change management . She was looking for a quiet office space to focus on writing and be social during her coffee breaks. Our hot desk was a perfect match for her. Her gentle and humble nature is an asset for us. A good thing about renting and sharing office space in Bærum International hub is that you can get access to free expertise of people and get in touch with beautiful souls. You get desk, chair and an opportunity to connect through sharing knowledge and experience. This is a huge bonus. Grab your chance and book a meeting with us. Maybe you can meet your new business partner? Or A new customer? Or even a spouse? With us, everything is possible!